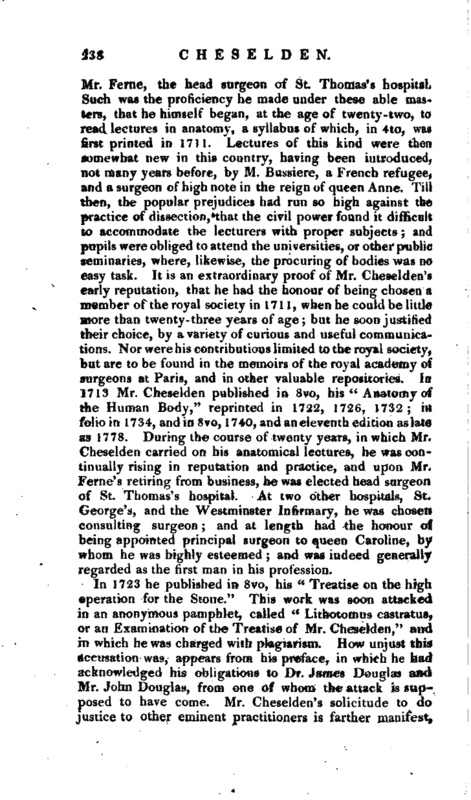 , an eminent surgeon and anatomist, and a celebrated writer, was born Oct. 19, 1688, at Burrow-on-the-Hill, near Somerby in Leicestershire. After having received a classical education, and been instructed in the rudiments of his profession at Leicester, he was placed about 1703, under the immediate tuition of the celebrated anatomist Cowper, and resided in his house, and at the same time studied surgery under | Mr. Feme, the head surgeon of St. Thomas’s hospital. Such was the proficiency he made under these able masters, that he himself began, at the age of twenty-two, to read lectures in anatomy, a syllabus of which, in 4to, was first printed in 1711. 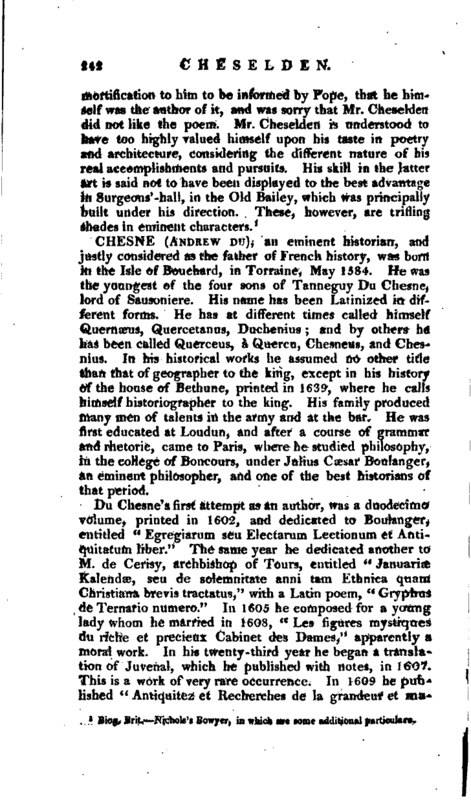 Lectures of this kind were then, somewhat new in this country, having been introduced, not many years before, by M. Bussiere, a French refugee, and a surgeon of high note in the reign of queen Anne. Till then, the popular prejudices had run so high against the practice of dissection, that the civil power found it difficult to accommodate the lecturers with proper subjects; and pupils were obliged to attend the universities, or other public seminaries, where, likewise, the procuring of bodies was no easy task. 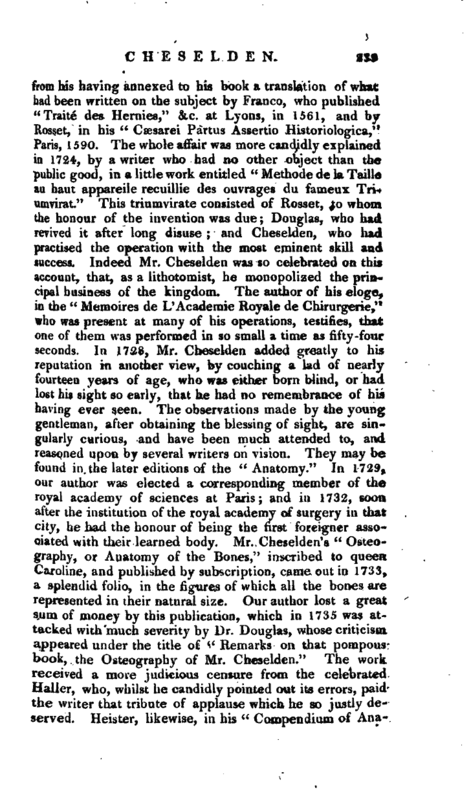 It is an extraordinary proof of Mr. Cheselden’s early reputation, that he had the honour of being chosen a member of the royal society in 1711, when he could be little more than twenty- three years of age but he soon justified their choice, by a variety of curious and useful communications. Nor were his contributions limited to the royal society, but are to be found in the memoirs of the royal academy of surgeons at Paris, and in other valuable repositories. In 1713 Mr. Cheselden published in 8vo, his “Anatomy of the Human Body,” reprinted in 1722, 1726, 1732; in folio in 1734, and in 8vo, 1740, and an eleventh edition aslate as 1778. 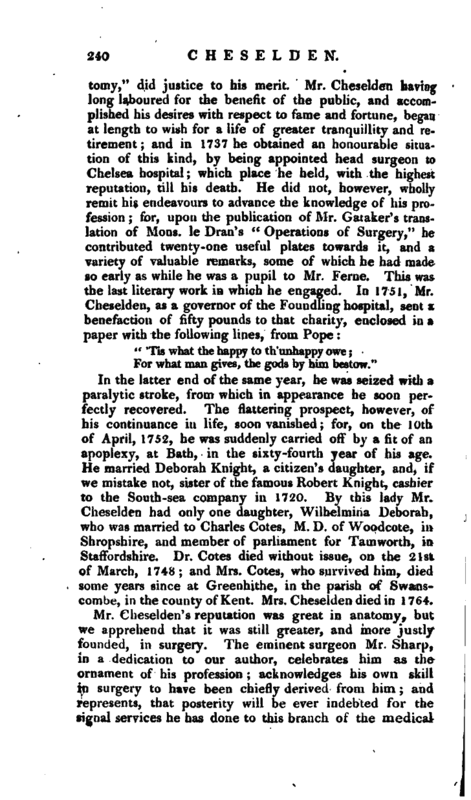 During the course of twenty years, in which Mr. Cheselden carried on his anatomical lectures, he was continually rising in reputation and practice, and upon Mr. Feme’s retiring from business, he was elected head surgeon of St. Thomas’s hospital. At two other hospitals, St. George’s, and the Westminster Infirmary, he was chosen consulting surgeon; and at length had the honour of being appointed principal surgeon to queen Caroline, by whom he was highly esteemed; and was indeed generally regarded as the first man in his profession. For what man gives, the gods by him bestow." In the latter end of the same year, he was seized with a paralytic stroke, from which in appearance he soon perfectly recovered. The flattering prospect, however, of his continuanc6 in life, soon vanished; for, on the 1 Oth of April, 1752, he was suddenly carried off by a fit of an apoplexy, at Bath, in the sixty -fourth year of his age. He married Deborah Knight, a citizen’s daughter, and, if we mistake not, sister of the famous Robert Knight, cashier to the South-sea company in 1720. By this lady Mr. Cheselden had only one daughter, Wilhelmina Deborah, who was married to Charles Cotes, M. D. of Woodcote, in Shropshire, and member of parliament for Tamworth, in Staffordshire. Dr. Cotes died without issue, on the 2 1st of March, 1748; and Mrs. Cotes, who survived him, died some years since at Greenhithe, in the parish of Swanscombe, in the county of Kent. Mrs. Cheselden died in 1764. Mr. Cheselden’s reputation was great in anatomy, but we apprehend that it was still greater, and more justly founded, in surgery. The eminent surgeon Mr. Sharp, in a dedication to our author, celebrates him as the ornament of his profession; acknowledges his own skill in surgery to have been chiefly derived from him; and represents, that posterity will be ever indebted for the signal services he has done to this branch of the medical | art. In surgery he was undoubtedly a great improver, having introduced simplicity into the practice of it, and laid aside the operose and hurtful French instruments which had been formerly in use. Guided by consummate skill, perfectly master of his hand, fruitful in resources, he was prepared for all events, and performed every operation with remarkable dexterity and coolness. Being fully competent to each possible case, he was successful in all. He was at the same time eminently distinguished by his tenderness to his patients. Whenever he entered the hospital on his morning visits, the reflection of what he was unavoidably to perform, impressed him with uneasy sensations; and it is even said that he was generally sick with anxiety before he began an operation, though during the performance of it he was, as hath already been observed, remarkably cool and self-collected. Our author’s eulogist relates a striking contrast between him and a French surgeon of eminence. 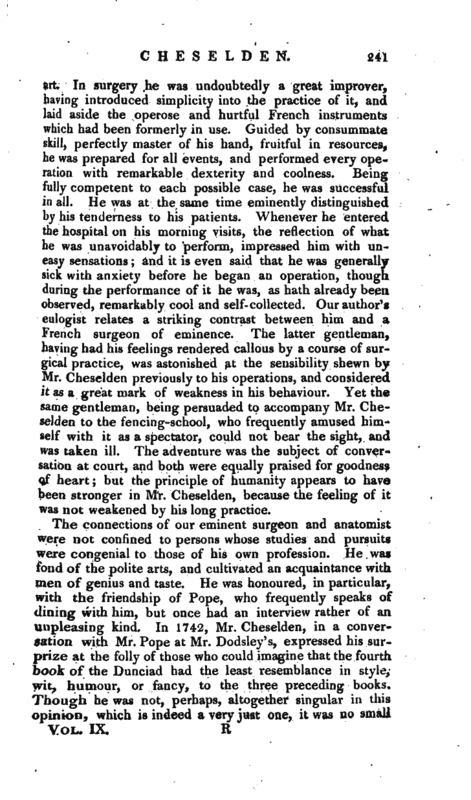 The latter gentleman, having had his feelings rendered callous by a course of surgical practice, was astonished at the sensibility shewn by Mr. Cheselden previously to his operations, and considered it as a great mark of weakness in his behaviour. Yet the same gentleman, being persuaded to accompany Mr. Cheselden to the fencing-school, who frequently amused himself with it as a spectator, could not bear the sight, and was taken ill. The adventure was the subject of conversation at court, and both were equally praised for goodness of heart; but the principle of humanity appears to have been stronger in Mr. Cheselden, because the feeling of it was not weakened by his long practice. Biog. Brit. 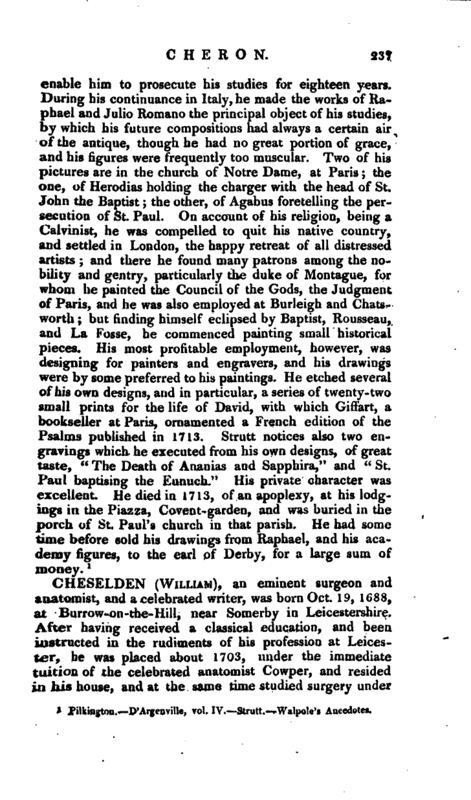 Nichols’s Bowyer, in which are some additional particulars.